Tonight I was grateful to have received from Pearson Education the book VCP4 Exam Cram: VMware Certified Professional (2nd Edition). The book is authored by Elias Khnaser (Twitter WWW) along with Technical Editors Brian Atkinson (WWW) and my friend Gabrie van Zanten (Twitter WWW). This 2nd edition is 340 pages in length and ships with a cardboard fact filled cram sheet in the front as well as a CD in the back which contains VCP4 practice exams and an electronic versions of the cardboard cram sheet in case your friends are jealous of your intimate VMware vSphere knowledge and decide to swipe yours. There are a very few number of books which focus specifically on the VCP-410 exam. This one is hot off the presses; published on January 31, 2011. As such I would expect to find the most recent and relevant vSphere as well as exam information contained within. Admittedly, I have not read this book cover to cover and have no plans to having passed the VCP4 17 months ago. However, I have thumbed through several sections admiring the quality and thorough coverage of exam blueprint objectives. This one looks pretty good and based on my positive experience with Exam Cram books in the past (Active Directory Services Design), I would recommend this book. As a certification focused text, it contains practice questions at the end of each chapter and a comprehensive 75 question practice exam at the end of the book to test your knowledge. Elias is open in that this book is recommended as supplemental learning in addition to the VMware ICM class (required for the certification) and a few other sources such as the VMware PDF documentation, but to be honest I think he sells himself a little short. 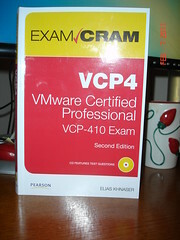 At well over 300 pages of exam focused material, I think it will go a long way towards passing the VCP-410 written test. The book is available at Amazon in paperback for $28.40 or the Kindle version for $25.56. Pearson was kind enough to ship me several copies which I will make available an the upcoming Minneapolis VMware User Group meeting. What are you still doing here? You should be reading this book. Go. Sweet will definetly be picking this book up real soon!